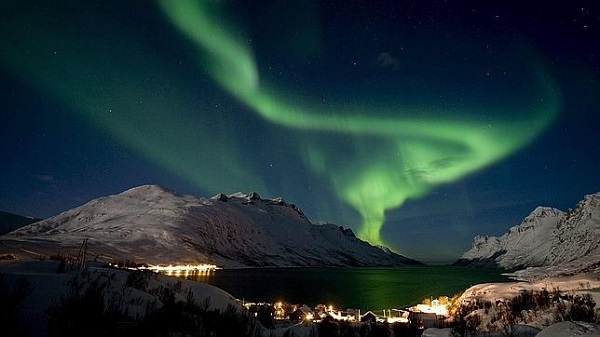 Everyone has always been fascinated at the Northern Lights. To see how the sky lights and colored ink is a magical experience. It’s no wonder that the ancient Vikings and the northern towns considered them as a divine manifestation. But nowadays we know they are a phenomenon well understood in its basic principles. Do you also want to know them? Well then let’s go! I t’s important to know the Northern Lights are only half of what really happens; Aurora Australis also exist and they take place and are visible from the South Pole. We know more about the Northern Lights because we are closer, but they’re not the only ones there. Both phenomena are produced by the same principles, which are in broad strokes the ionization of atmospheric gas due to solar wind and cosmic rays. The solar wind is composed of electrically charged subatomic particles that reach the Earth with high energy; meanwhile also cosmic rays are subatomic particles coming with a lot more energy, but in smaller amounts. When these particles reach the atmosphere and “collide” with its atoms, ionization occurs; which means, they rip off electrons from the atom in question turning it into a positive charged ion. When these ions are able to attract an electron and return to their original state they emit a photon of light that depends on the electron that has been torn and the atom that experiments the process. In this way we can establish a simplistic relationship to say the green and orange-reddish auroras are due to interactions with oxygen, while interactions with nitrogen have a blue colour, although they can alsobe red if the particle is not able to tear the electron completely. But this still doesn’t explain why it happens only at the poles, oxygen and nitrogen are the most abundant gases on Earth and aren’t just in the poles! Here’s where it plays an important role the largely invisible shield of the Earth: the magnetosphere. The Earth has a magnetic field around it and whose force lines are leaving a pole and ending up in the other. Any charged particle tends to rotate around these lines so that the solar wind (at least the electrically charged part) is deflected by the magnetic field. The result is just the imaginable: the particles undergo a deflection which moves them toward the poles, where the entry of the majority of these particles occurs. The more particles, the greater the probability of ionizing the gas and the more intense the light emitted by the atmosphere. As you can see, at no time we talked about the formation being favored in one of the poles over the other.